If you’ve ever gotten into conversations with broke friends about money, you know how hard it is to determine if they actually want your help. There are ways to figure that out and perhaps lead your discussion to deeper levels. If that happens, you’ll learn more about your friend’s financial struggles and perhaps be able to offer some counsel. Invest, invest, and invest some more. 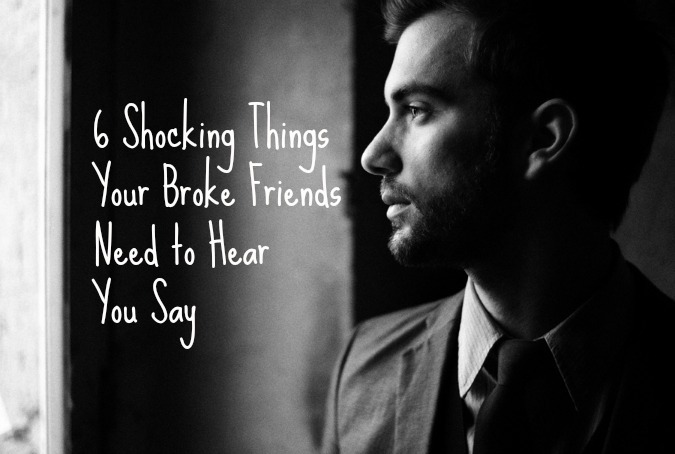 But your broke friends might not want to listen or hear any of that. When someone is in a heap of financial trouble there are reasons for that trouble. Those reasons could be diverse. However, more than likely they result from lack of knowledge and poor behaviors/decisions. When our way of life becomes ingrained – in other words, normal and acceptable to us – we really don’t want to hear ways to live differently. We have your set routines and way of thinking. The more we practice the same things over and over the less likely it will be for use to break out of the mold and see things differently. Even in the realm of money.